1. The debate over the contents and the effects of the so-called Dublin System (currently enshrined in the Regulation Dublin III and in the Regulation Eurodac II) gained momentum in the last years, due to the effects of the dramatic events taking place close to the EU’s borders. Especially in 2015, the EU supranational institutions (see the Commission’s Agenda on Migration, at 15, and the European Parliament’s Resolution of 29 April 2015, among others) and the Member States meeting in the European Council (see the Conclusions of 15 October 2015, para. 3) could not avoid to admit that the time for seriously reconsidering some aspects of this system had finally come. In particular, the points felt to be worth of discussion are: i) the definition of the criteria of allocation of the competence to receive and treat an asylum claim; ii) the effects that they produce on front line States and other States; and iii) the overall question of the fairness of the system in the view of an equitable burden sharing among Member States, according to Article 80 TFEU. On these and other controversial issues, the intergovernmental level proved much more emphatic than resolute and witnessed some dramatic confrontations (see for instance Di Bartolomeo; Carrera & Gros; Labayle & de Bruycker; Maiani; Pastore; Roman; Zorzi Giustiniani). A recent document issued by the Commission offers the possibility to put forward some remarks about the ability of this supranational institution to give a real contribution to a complicated debate, where much of the credibility of the EU as a governance actor is at stake. Of course, Juncker and Co. do not act in a vacuum. They must respect the leading role of the European Council in giving the EU the “necessary impetus for its development” and in defining “the general political directions and priorities thereof” (Article 15 TEU). Moreover, they must take into account that a broad consensus with the Member States is to be reached if an innovative proposal is put forward in the context of legislative procedures. This being said, however, the Commission (eventually backed by the European Parliament) embodies the supranational dimension of the EU and possesses the full right and capacity to express its own positions, in a dialectic relationship with Member States and the institutions representing them. In view of the above, some political ambition is expected by this Commission. The Dublin System has been the object of various criticism, either by specialised academics and by leading NGOs, and proved to be totally ineffective at the practical level (see Di Filippo for further references): maintaining the status quo is simply not possible. 2. On the 6th of April 2016 the Commission released a long awaited Communication entitled «Towards a reform of the Common European Asylum System and enhancing legal avenues to Europe», which devotes some space to the possible reform of the Regulation Dublin III. Due to the limited space available in this post, the other parts of the Communication will not be commented here, except whenever relevant for expressing a judgement on the Dublin issue. The Commission envisages two possible approaches, after having made some preliminary remarks, which deserve a brief comment. Firstly, the Commission lists several shortcomings in the design and implementation of the Dublin Regulation (at 4), but most of them are put in relation, to a larger or lesser extent, with the current crisis or are exacerbated by it, thus justifying a reform initiative (at 7). It is striking that the main reasons why Dublin does not work (namely, the irrationality of the criteria used for determining the competent State and the scarce attention paid to the asylum seekers’ personal situation) are not directly tackled. Even worse, the Commission does not put in the right context the fact that the system is seriously flawed since many years, no matter if a mass influx is ongoing or not (Di Filippo, para. 2 and further references there, as well as the recent external evaluation reports funded by the Commission itself). Secondly, it seems that the only real alternative to the current system is to allow asylum seekers to freely choose the competent State (at 7). It is true that some NGOs repeatedly claimed for such an approach, but this is not the only possible solution. True, a different conception of criteria may be advanced, and has been actually proposed, where a sound and reasonable connection between the asylum seeker and the competent State is established. This way, the ordinary functioning of the system would be more viable and less conflictual, leaving room only for corrective or emergency measures only when really needed (see Di Filippo, para. 3; UNHCR, para. 6, at 7; The Greens/EFA, at 5 ff.). Additionally, other approaches have been proposed, such as supplementing the existing criteria with a regime of mutual recognition of international protection status and of freedom of movement in the European Union (see ECRE; for this and other proposals, see also Guild and others, at 29-36). It appears surprising that the Commission only refers to an alternative solution (the free choice criterion), which is clearly utopic at this stage of the European integration process: by doing so, it “forgets” the terms of a much richer debate carried out in Europe in the last years and goes back to the old and ineffective State-centred vision. Thirdly, as already mentioned, both options advanced by the Commission are confined to situations of mass influx. In the ordinary situations, the present criteria would be left untouched. This choice is flawed, given that many of the problems of the Dublin system will persist on the background, with a disappointingly low degree of compliance (both by States and asylum seekers). Treating only the final symptoms and not the root causes of a disease is the first mistake to be avoided, just because the crisis is striking and it will last for years. 3. Let us come now to the two alternatives presented by the Commission. The first option consists of a slight modification of the current framework and of the pending proposal presented in September 2015 in order to introduce a permanent system of emergency relocation in situation of crisis. The usual (and frankly untenable) criterion of first entry would be maintained, because the Commission still deems sound what reality shows to be totally unsound, i.e. to maintain «a linkage between the allocation of responsibility in the field of asylum and the respect by Member States of their obligations in terms of protection of the external border» (at 7). A supplementary corrective mechanism would be added to this “linkage”, largely inspired to the above mentioned proposal and slightly modified by two adjustments: i) a reference threshold to trigger the application of the emergency relocation scheme; ii) a wider scope of the mechanism, including now any applicant with a reasonable likelihood of being granted international protection (and not just of nationalities with a recognition rate of at least 75%, as it currently stands). While these two changes are not questionable per se, what is surprising is that the Commission does not seriously address the practical failure (well documented by the Commission itself) of the first ever experiment of relocation (launched in September 2015 with Decisions No. 2015/1523/EU and No. 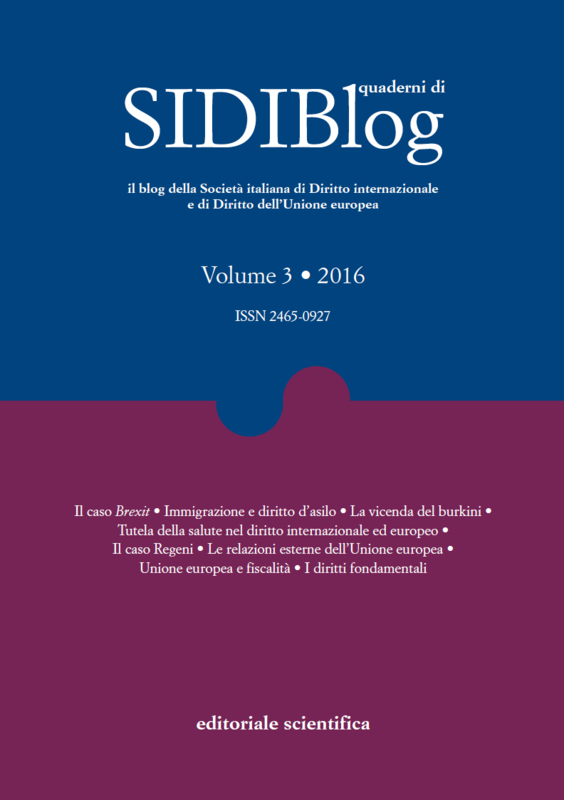 2015/1601/EU) and the several legal flaws of the solutions so far envisaged (on this issue, see Di Filippo). Should be this one the approach pursued by the EU, the often abused expression “Much Ado about Nothing” would prove appropriate. The second option envisaged in the Communication is less conservative and attracts more interest. The determination of responsibility would for the most part no longer be linked with the Member State of first application or irregular entry. Instead, responsibility would be primarily allocated on the basis of a «distribution key» reflecting the relative size, wealth and absorption capacities of the Member States. According to this system, applicants would be directly allocated, on the basis of the distribution key, to another Member State when they make an application anywhere in the EU. What is not explained is how people would be “primarily” or normally allocated to a certain State (maybe a lottery?). At a first sight, this approach looks highly questionable, because persons are not postal packages and due consideration should be given to their actual chance to integrate and to quickly become independent by public aid (as aptly emphasized by the Italian Council for Refugees). However, another element spelled in the proposal deserves attention and, in my opinion, a better placement in the imagined new infrastructure. The Commission admits that some “overriding criteria” would prevail over the “blind” distribution key: where some connecting factors with a given Member State are present (such as family or dependency links, the best interest of the child, and possession of a visa or residence permit), the asylum seeker would be allocated to this country. This could result in a corresponding deduction from this Member State’s allocation under the key. As for the verification of the occurrence of one of those criteria, two alternatives are suggested: the related assessment should be conducted by the State where the application is lodged or by the State assigned according to the distribution key. To my view, in order to avoid duplications, superfluous uncertainties and loss of time, the only reasonable solution would be to carry out this enquiry in the country of first entrance or where the application is presented. 4. More importantly, it seems to me that a more workable balance could be drawn between a distribution key approach and what elsewhere I referred to as a genuine link approach. Some connecting criteria should be given primacy but in a different way: not as a corrective tool to a bureaucratic, State-centred and somewhat mysterious system of transfer of people in need of international protection, but as a primary title for determining jurisdiction, whenever a mass influx occurs or an ordinary situation is at stake. Only when no substantial link exists with a given Member State, the asylum seeker would be allocated to a country in a sort of casuistic manner, giving precedence to the State with the lowest performance in fulfilling a reference quota (to be determined on a regular basis according to a distribution key). Furthermore, a careful consideration of those primary (and not overriding) criteria is needed: family and dependency links and the best interest of the child are fine, but they may be drafted in restrictive or generous terms. The consequences are not ancillary. If actual compliance with the Dublin system by asylum seekers is sought (and in my opinion, it must be a priority), a reasonable and holistic definition of such criteria is needed. To this respect, the current contents of family and dependency clauses in the Dublin III Regulation are sometimes too restrictive, and should be revised in a more flexible way. Moreover, factors as linguistic and cultural ties, or past study or professional experiences, or private sponsorship (the latter evoked in the Communication but only in the context of legal entry options into the EU territory, at 15) would need careful consideration (see also UNHCR, at 7; the European Parliament resolution of 12 April 2016 on the situation in the Mediterranean and the need for a holistic EU approach to migration, paras. 19 and 33-36). In current EU law some (partial) references to such approach are already present (see Decision No. 2015/1601, recital 34; Directive No. 2013/32/EU, Article 38, para. 2, sub a and c): here it is advocated a more systematic use of it. In order to contrast the possible objections coming from certain (and only certain) States, an already overburdened country (for instance Germany or Sweden in the current phase) should be afforded the possibility to refuse responsibility, provided that some core family ties are safeguarded (especially to the benefit of minors and of the spouse). In such cases, a less connected country (if present) should be responsible, or the one less engaged in hosting asylum seekers and refugees. A new system of allocation of competence based on reasonable criteria (and coupled with financial incentives/disincentives for Member States) would favour more compliance by asylum seekers, reduce tension among Member States and ease the integration process of recognized refugees, with significant savings in public expenditure and more social cohesion. Only in this perspective, the somewhat draconian severity towards secondary movements (arising out of almost every paragraph of the Communication, and expressly addressed at 11-12) would perhaps be justifiable (although some solutions therein spelled appear to be excessive, as rightly underlined by Human Rights Watch and the British Refugee Council). To this end, option No. 2 by the Commission is a step forward (especially for the circumstance that it certifies the need to distribute asylum seekers in a new manner, more coherent with the principles enshrined in Article 80 TFEU), but it appears as a sort of half-step: a more courageous move is required, in order to get all the potential advantages of this new vision (for further details, see Di Filippo, paras. 3-6).